Why do you want a topic cluster? Why did you want a cellular telephone in 1983? Why did you want the internet in 1995? Why did you want to join Instagram in 2010? Because the past is our future, as is our present. You can’t stop inexorable tech zeitgeist — just adapt. Think of topic clusters like a crudely crayon-drawn diagram illustrated by a toddler. There are pillar pages (these are important — hence the boldface) that correspond with your organization’s main spheres of focus. 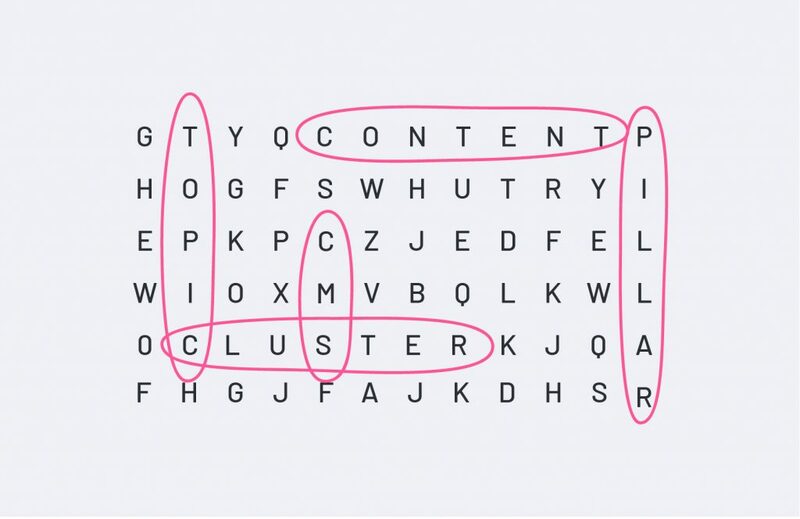 Linking to the pillar content is cluster content (sub-topics) — a granular take on the topic that provides more focus and depth for specific, relevant long-tail keywords or phrases. The pillar links to each cluster page and vice-versa with the same hyperlinked keyword. It’s an M.C. Escher painting in a fun-house wall of mirrors; a symbiotic, positive feedback loop in a digital ecosystem; a crayon-drawing from a toddler. Pillar pages and topic clusters are better than what you’re currently doing (probably), in that not only does it better format your site’s information architecture (IA) — but one high-performing cluster page can elevate rankings for all other pages linked to the same pillar. They’re chained together, but in a way that epitomizes freedom, growth and access for content. Want Better IA? Topic Cluster. Sound IA is paramount for ranking well in organic searches — and lasered-in content clusters that give your target audience something they actually want will manifest in higher efficiency for your search marketing while gutting redundant content. In subatomic terms, the pillar content is the nucleus and the cluster content the circling electrons — done correctly it’ll fuel your site with a power rivaling nuclear fusion/fission: more efficient linking, jacked search rankings and an ideal user-experience. This model will bring in more leads than Don Draper and more traffic than LA rush hour. It’s also perfect for CTA’s, page tools and buttons that ‘generate’ something — tools always work well for pillar pages as they’re usually perennial content apt to be shared. Before you do any of this, make sure new topic clusters make sense for you/your organization. Does the search volume of your topic justify the time and energy this will take? Is there already content that addresses this topic? Well then, you should just give up — kidding, just add internal links to what you’ve already got. Do you want a robust deconstruction of every bit of minutia related to this topic? Draw out a handful of core problems with your buyer persona — use at least three colors of Expo markers on the walls and glass. Branch out the core topics and subtopics with applied keyword/SEO research. Correlate what content ideas go with which subtopics. Validate ideas with industry/competitor research. The answer to this question is super easy — no, it’s not. Firstly, never measure a campaign’s success through a content-by-content metric. Just looking at one post is too narrow and doesn’t fully appreciate the quieter benefits. Brand-driving content epitomizes this — the focus isn’t necessarily on sales or getting emails, but rather elevating brand visibility, hooking new recruits or swooping in for some backlinks. What topics garner the most leads? What topics perform best at driving traffic to your site? What topics drive the most revenue? What topics earn the most backlinks? Become a pillar of the digital community by wisely applying the aforementioned advice — don’t be just another mere pawn in the game; prove that content is King (and more importantly, Queen).